With this in mind, the National Telecommunications Regulatory Commission (NTRC) has issued a number of guidelines to ensure safe Internet use. The advice has come through the NTRCâs Information and Communication Technology (ICT) officer Marcellus Constance. On August 28, at the Evesham Learning Resource Centre, where the NTRC was holding an open community discussion, Constance explained what is cyber security and gave examples of cyber crime and how a person can remain safe while surfing the World Wide Web. The IT man said that while persons use the Internet for things like shopping, education, communication, research and online banking, criminals are right around the corner waiting for a chance to steal online personal information that can lead to identity theft and the loss of money from credit cards and debit cards. âInternet theft is the illegal use of someone elseâs personal information in order to obtain money and credit. This can happen to anyone on the Internetâ, said Constance. He explained that just as burglars break into houses, hackers break into computers. He stressed that hackers do not discriminate, as they break into both individual computers and large networks and may at times install malicious programmes to steal confidential data. Constance also said that persons must look out for online criminals who develop schemes, using one or more elements of the Internet to deprive a person of something they possess. âFor example, a person may put up a fake website online for you to sign into to get your passwordâ, said Constance. This has happened with the popular social network Facebook, where persons create fake Facebook websites and steal peopleâs passwords, hack their accounts and steal personal information. Constance, explaining how persons can protect themselves while surfing the Internet, said that they could use security software and keep it up to date, while they must always try to use genuine software among other things. âCheck to be sure that websites such as banking, online stores are security enabled. Look for web addresses with https:// which means the site takes extra measures to help secure your information as http:// is not secureâ, stressed Constance. The IT specialist also asked Internet users who have to create passwords to make their passwords strong by making them long, using capital letters, numbers, symbols and do not include your name. âDo not use the same password twice; use the password that means something to you onlyâ, said Constance. Other warnings given by Constance include being aware of email scams which may come from unknown persons; do not share too much information on social sites like Facebook, set up privacy restrictions; and do not believe everything you read online. Constance also touched on cyber bullying, which involves using the Internet to embarrass others. âStop before you post something and think about how you will feel if your family, teachers, neighbours or coaches see itâ, Constance said, while adding that persons should speak up if they feel uncomfortable or threatened by something they see online. âThe only thing that can stop a bad guy on the Internet is a good guy on the Internetâ, said Constance. 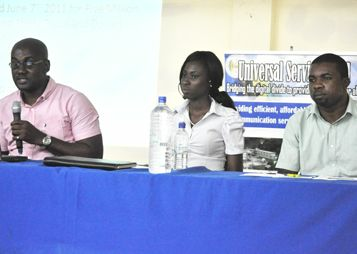 The community discussion also heard from Universal Service Fund (USF) administrator Kyron Duncan and NTRCâs accountant Mishka Quashie. Both Duncan and Quashie encouraged persons to use the NTRC to settle disputes that they may have with local telecoms providers, as that is one of the functions of the NTRC. More community discussions will be held at dates to be announced.